Today we’re going to talk about – um… hang on a sec, my phone is buzzing……… OK, sorry, I’m back. Um, so, yeah, haptics. Generically, it’s what we do on equipment to lend not only a sense of sound and sight for feedback, but also touch. 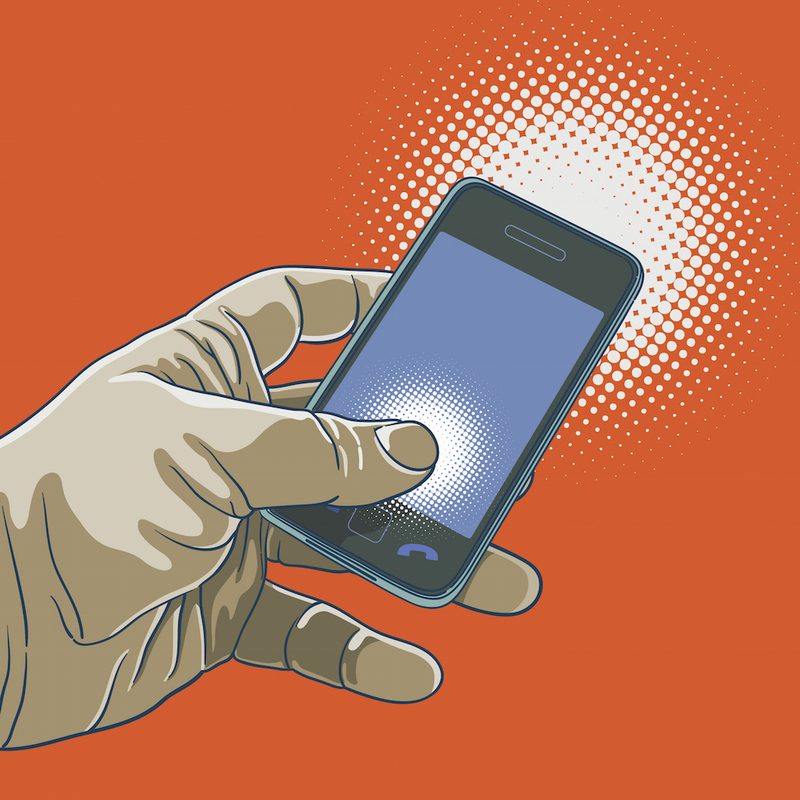 And that touch angle has many forms – like when your phone vibrates. But it also impacts, for instance, how a device gives tactile feedback regarding pushed buttons, as we discussed several years ago. That said, today’s haptics elements are relatively crude compared to what could, in theory, be possible. In fact, a couple of years ago, we explored some of the biological fundamentals that drive how we perceive haptics – and it’s kinda crazy. But some of those far-off dreams involve pretty sophisticated haptics actuators, which we don’t have today. Current technology mostly relies on either an eccentric rotating mass (ERM) – which leverages the phenomenon of the unbalanced washing machine, only on purpose – or a linear resonant actuator (LRA). These have medium to slow response, require low voltages, but also use lowish to high power. Most importantly, they’re cheap. Boréas is proposing to use piezoelectric (PZ) materials instead for faster response, lower power, and cost that they think should hit the mark as high volume production is reached. We’ll look specifically at what’s different with Boréas’s devices, but, before doing so, let’s review some of the basics of PZ technology. Piezoelectric materials have the unique property that, when deformed, they present a voltage across the material. We can do work with that voltage. Or, conversely, if we apply a voltage to the material, we can cause a deformation. It goes both ways. Depending on the material, however, the symmetry isn’t perfect. There is always symmetry in that you can respond to deformation or cause deformation, but one material (say, PZT) may be more efficient at turning a voltage into deformation, while another material (say, AlN) may be more efficient at responding to deformation to present a voltage, as we discussed with respect to energy harvesting. It’s like a lever: if the fulcrum isn’t exactly in the center, then you get more… wait for it… leverage on one side or the other, depending on whether you’re trying to use a lot of force to turn a little motion into a lot of low-force motion or using a little force with more motion to get a small amount of high-force motion. That said, PZ should work either way. So, when responding to deformation, it acts as a sensor. When creating deformation, it acts as an actuator. But because most materials are better at one than the other, most PZ applications have been for one or the other – not for both. 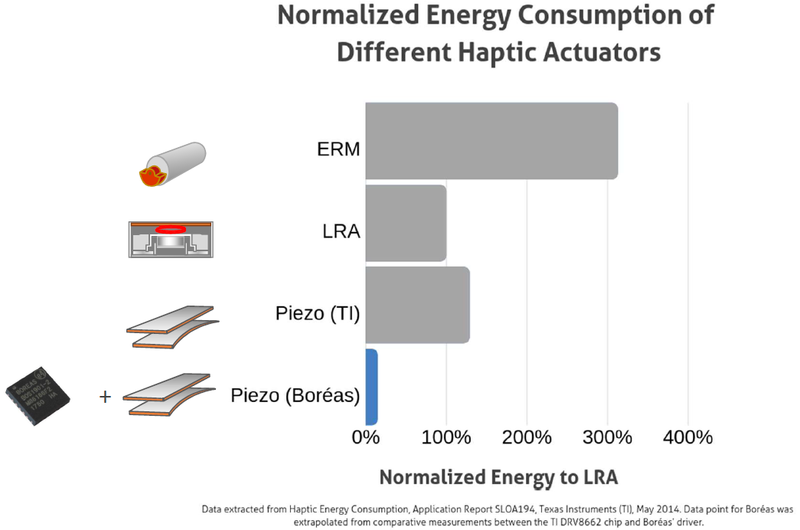 We see PZT for actuation and AlN for energy harvesting, for example. Of course, if we’re talking haptics, then we’re mostly talking about using PZ for actuating. It’s the motion that we set up that creates the tactile feedback we’re looking for. The architecture that Boréas describes has the actuator – a PZ material – on the bottom of the “stack,” a driver that controls the actuator, and then software above that that decides what signal the driver should send to the actuator. And, to be clear, when we say “driver,” we’re not talking about a thin software driver; we’re talking about a chip that literally drives voltages onto the actuator. And, in the case of PZ, those voltages can be high – from 50-200 volts peak-to-peak. That kind of voltage might suggest a high-power solution, which brings us to what’s new in Boréas’s offering. The first thing they say they’re offering is lower power. In fact, for today’s applications, that’s their main angle. Yes, having lower power is not obvious, given the higher voltages involved; it means that currents have been cut down by far more than the voltage went up. They show the following graph relating the power of the various solutions available today – including PZ from TI. The power numbers are normalized to that required by LRA solutions – the lowest-power of the non-Boréas solutions. Both TI’s PZ power and ERM solutions have significantly higher power. But the Boréas solution is 15% of the LRM power. But there’s another more futuristic angle that only PZ can leverage: it’s that symmetry thing. Right now, we’re using the PZ as an actuator – say, for letting you feel that you successfully pressed a button. But what if you also used the finger pressure on the button as input back to the phone or whatever gadget it is? Instead of doing the usual touch-detection thing, you could create a voltage when pressing the button, and that voltage could signal back that the button was pushed and trigger the feedback signal. For compatibility with existing haptics interfaces, it’s still a one-port solution; you don’t get one port for actuating and another one for sensing; they share the same port. The easiest way to handle this would be, in effect, half duplex. That means that the haptics device would be either a sensor or an actuator at any given moment. If used to detect a button-push, for example, first, it would be a sensor looking for the push. After the push is detected, then it can flip into actuator mode for delivering the feedback response. Full-duplex operation would be subtler. The details haven’t been worked out on this, but, in essence, if someone touches the button while it’s vibrating, then the net voltage will be a mix of the driven voltage and the voltage generated by the touch. Since you know the driver signal, you can subtract it from the combined signal to get the generated signal (much the way old phone handsets subtracted your voice from the signal on the wire – a combination of your voice and the received voice – in order to isolate the received voice signal). Boréas’s main point here is that, even if these applications haven’t been enabled yet, they can be done with no new hardware if you’re already using their driver. It becomes a software thing then. While the PZ interface of the driver is analog, the host-side interface is all digital, using SPI for communication. A microcontroller (or whatever) controls the driver and sets the voltage (which may vary by actuator). That MCU provides signals that run in real time. It’s not a, “Run a sine wave and… go!” thing; if you want a sine wave, then the MCU provides that (digitized) sine wave in real time. Buttons are pretty crude instruments. You create a space large enough for, say, my fat thumb to hit, and you then make it buzz or sense the press or whatever. In an application like this, you would likely have one actuator per button. Boréas is betting that the size, cost, and power of their solution will make multiple actuators doable. But it’s also possible to be far more elaborate with an array approach. By sending complex signals that cancel each other except at desired locations, you can create “pictures” of higher resolution, effectively adding relief to what would otherwise be flat images, making the entire screen haptic-capable. They say that clever DSP algorithms would be required to make that work, but that it’s possible in the long-term. What do you think of Boréas’s approach to haptics using piezoelectric materials?